For a busy professional, weekends can’t come fast enough. Although I often dream of making grand weekend plans, sometimes my biggest weekend joy is very simple. It’s going to brunch. What makes a good brunch? To make my Top 5, there must first be protein, like eggs or bacon – but somehow indulgent. Since brunch is two meals combined in one, if I’m not eating again until dinner, this meal needs to be filling as well. I also look for items I wouldn’t make at home, so most of the time pancakes and waffles don’t make the cut. Of the slew of brunches that have sprung up in town within the last year or so, these are my favorites. Since they’re so central, it’s easy to round up the gang to go eat on a lazy Saturday or Sunday morning. 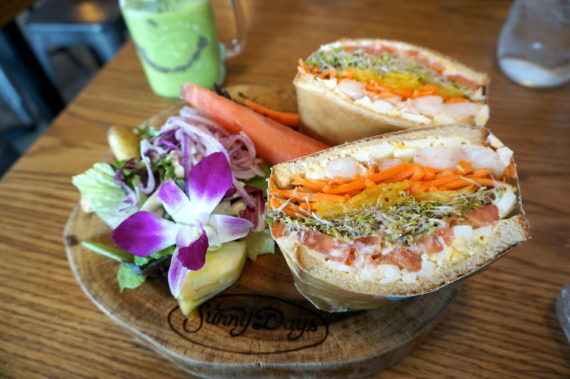 Sunny Days is a charming new restaurant in the same shopping complex as Bogart’s — and there’s usually no line. The place feels like a bright, chic beach house hangout, a great spot for pre- or post-beach outings. In addition to savory items like Loco Moco ($16), there’s dessert brunch dishes like Mango Bowls ($14), Very Berry Pancakes ($17) and a good selection of lattes, smoothies and cold-pressed juices. Portions here are generous and seem to come with a salad, so come hungry. I’m not sure how long this will remain a hidden gem. It’s also an Ocean Friendly Restaurant. Try the Eggs Benedict ($16), which comes topped with crispy bacon, avocado and a light hollandaise. The green salad keeps things healthy. The Shrimp Sprout Sandwich ($15) is another colorful brunch option, with eggs and lots of veggies to accompany the shrimp. Egghead Cafe is one of my favorites because it serves brunch every day. Their menu is Taiwanese-inspired and offers more than 40 breakfast choices including benedicts, omelets, French toast, pancakes, salads, sandwiches and even an acai bowl. Most entrees are under $13, and they offer a ton of espresso and coffee drinks. Points for the caffeine options. Next on my list to try is the Mexican Benedict ($10.25) topped with chorizo, sour cream and salsa verde. Someone needs to order the Green Tea Azuki ($13.95) or Tiramisu ($13.95) Pancakes so I can taste them. 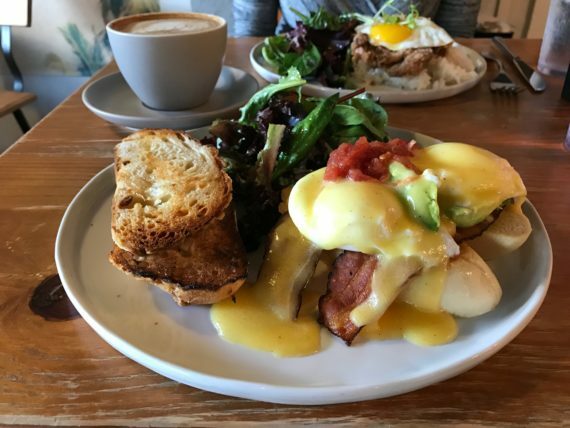 Located in the old I Love Country Cafe spot in Kakaako, Egghead Cafe is a perfect little hideout where you can slip in and out. Egghead Cafe’s Special Fried Pork Chop Plate ($12) is seriously satisfying. 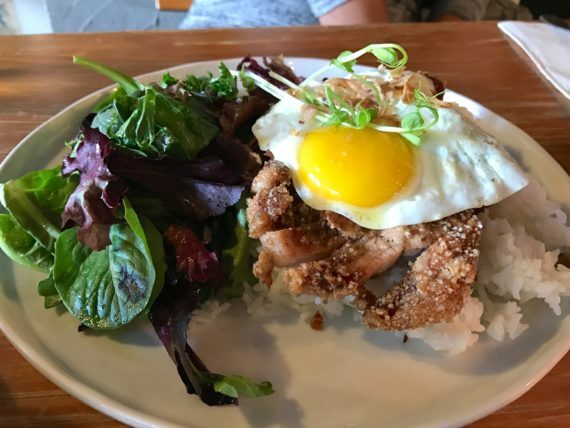 You can’t go wrong with fried pork, white rice and a sunny side up egg, and this pork skin is especially crispy. It’s fairly obvious I’m a fan of eggs benedict. 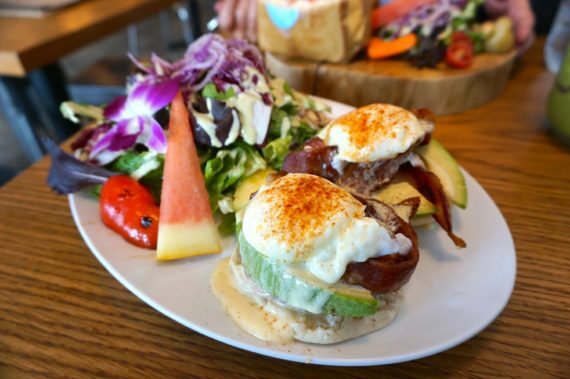 This California Benedict ($11.95) features bacon, avocado and salsa on French bread. Brunch Tuesday – Friday 7 a.m. – 2 p.m., Saturday – Sunday 7 a.m. – 3 p.m. I love eating plant-based lunches at Vegan Hills, which just opened this spring, so was excited when they added a Saturday brunch. The brunch menu is three pages long, with items like Strawberry Princess Pancakes ($16) and Balinese Fried Rice ($16). Some lunch items like Why Not Chos ($15) make cameo appearances on the brunch menu. The bright modern setting and convenient location in Kaimuki make this a fun gathering spot. The Benevolent Benedict ($20) is surprisingly filling. 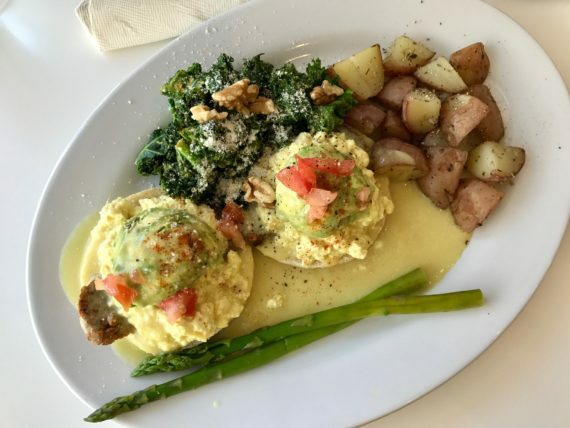 The English muffin is topped with organic tempeh bacon, an organic tofu scramble, avocado and a light vegan hollandaise sauce. 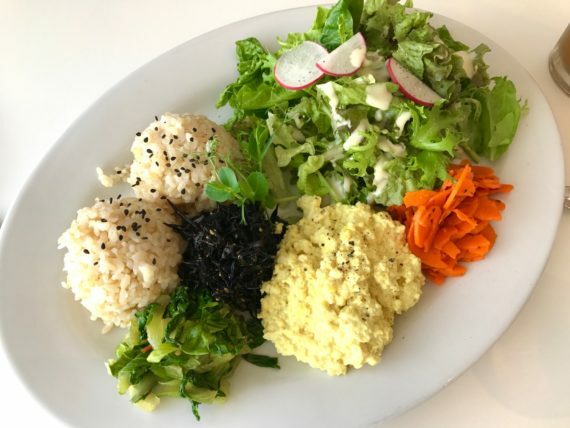 The Japanese-style Zen Breakfast ($16) features a tofu scramble, hijiki, sauteed bok choy, carrots, mixed greens and a side of nori soup. Brunch Saturday, 9 a.m. – 3 p.m. It seems like every weekend, a line of hungry people is waiting to get in to the new Scratch Kitchen and Meatery on the outside of South Shore Market. This spinoff of Scratch Kitchen in Chinatown opened in April and serves brunch all day, only with more meat options. The restaurant has a modern industrial feel, with an open kitchen at the center. All of the brunch items look droolworthy, especially the the pork adobo loco moco ($14), country eggs benny with fried green tomato ($13) and Creole shrimp and grits ($15). Another plus: Lighting is great here, so social media food posts come easy. 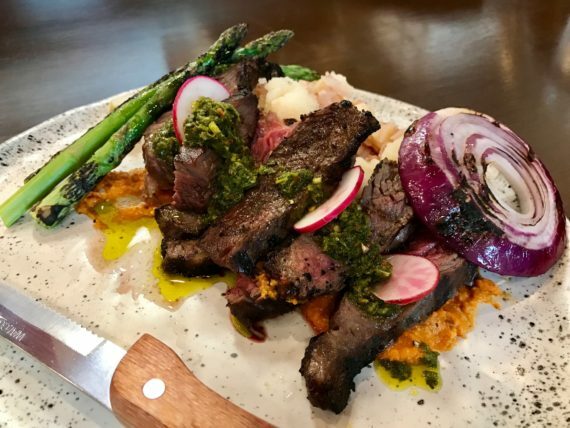 I would go back just for this Grilled Short Rib “Salad” ($16) with chimichurri, warm vinegary potatoes and asparagus. 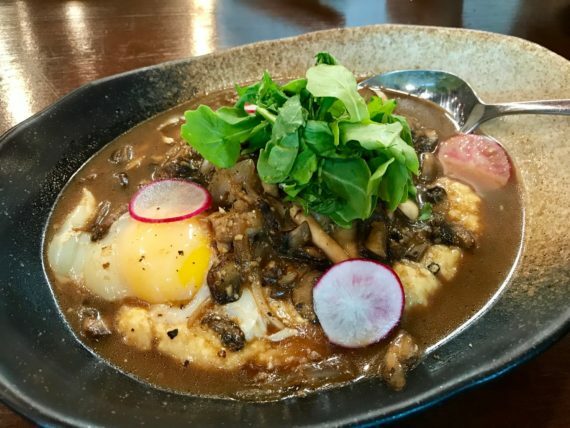 The Marsala Roasted Shrooms ($13) is a decadent bowl of grits, truffle essence, marsala cream, arugula and poached eggs. It makes a great dipping sauce for Scratch’s English Muffin or biscuit. Brunch daily 9 a.m. – 3 p.m.
It’s been a year since Mud Hen Water started serving its out-of-the-box brunch, and a few things have changed since then. First, it’s now open on Sundays. Woohoo! Second, chef Ed Kenney’s travels with his PBS TV series “Family Ingredients” has inspired more than one menu item. His trip the Philippines with “Top Chef” finalist Sheldon Simeon inspired his Pork Sisig, an OMG dish that wowed all of my fellow brunchers. The pork is expertly seasoned with shoyu, coconut, vinegar, calamansi, garlic, ginger and onion, and comes out on a sizzling hot plate topped with an egg. My other brunch favorites here are the corned beef and kalo hash ($15) and fresh fish and luau ($18). Mud Hen Water is my go-to for dishes that are sustainably, locally sourced, and can be found only in Hawaii. Parking is easy to find behind the restaurant or along 9th Avenue. 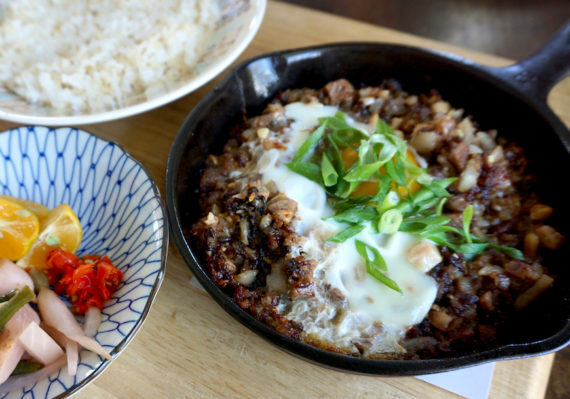 The Pork Sisig or sizzling pig head ($14) entree is the new must-try dish on the brunch menu. You cook the egg in the hot plate, stir and serve on top of rice. A squeeze of calamansi adds a hint of citrus. Mud Hen’s Biscuit and Mapo Gravy ($13) entree tastes as good as it looks. 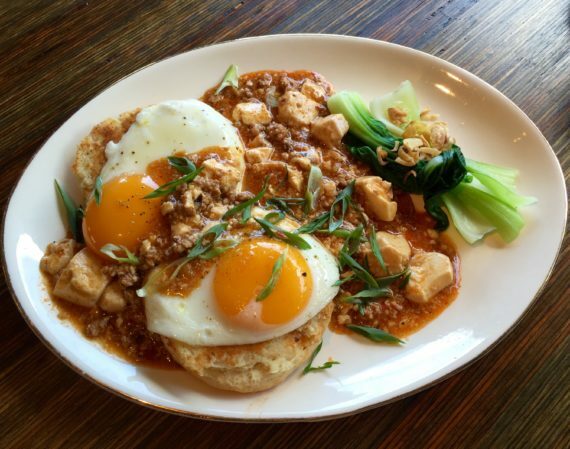 The two eggs and biscuits are befriended by pork, tofu, crispy shallots and bok choy. Brunch Saturdays and Sundays, 9:30 a.m. – 2 p.m.
Getting brunch cravings but don’t live in town? Here’s Our Top 5: Leeward brunches. And stay tuned for Our Top 5 boozy brunches … coming soon!